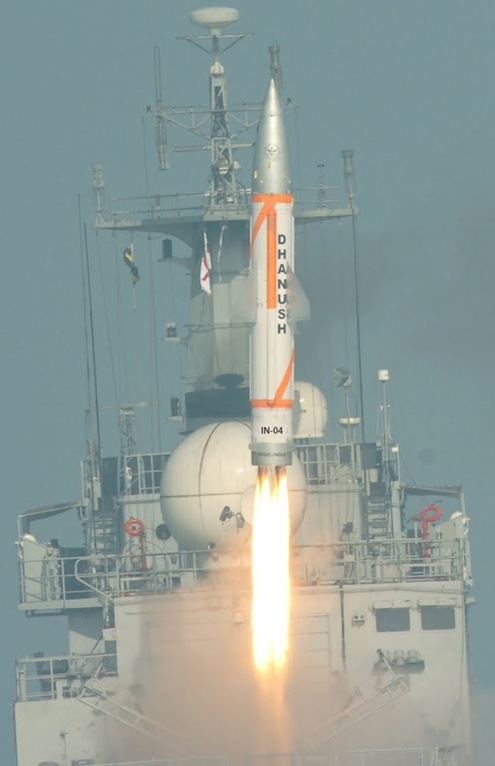 India’s indigenous, nuclear capable ‘Dhanush’ missile was test fired from Indian Navy’s Offshore Patrol Vessel INS Suvarna (P 52), off the coast of Orissa on March 11, 2011. (Photo on the right is from Press Information Bureau). Dhanush is the naval version of the ‘Prithvi’ surface-to-surface missile. In addition ‘Prithvi’ missile was also test fired same day from the Integrated Test Range (ITR) at Chandipur-on-sea. Both missiles met their objectives set by the Strategic Forces Command. On January 04, 2003 Cabinet Committee on Security (CCS), approved the appointment of a Commander – in – Chief, Strategic Forces Command to manage and administer all Strategic Forces. Here is another photograph showing INS Suvarna launching Dhanush missile.